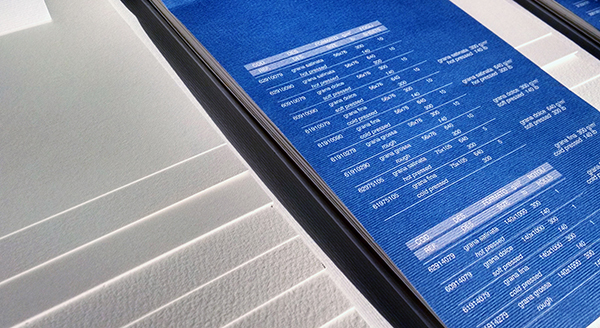 Orders over 120 square inches can also receive free 2-day shipping within the US. And one other improvement for 2017: we’ve added PayPal as a payment option for supply orders. 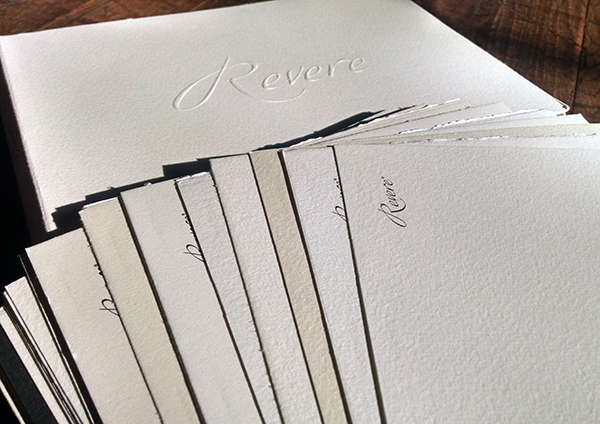 We’re in love with the fact that at-home do-it-yourself letterpress machines are giving access to the beautiful world of letterpress to those who are hands-on and are looking to stay budget-friendly for printing projects (hand-made wedding invites or business cards, anyone?). 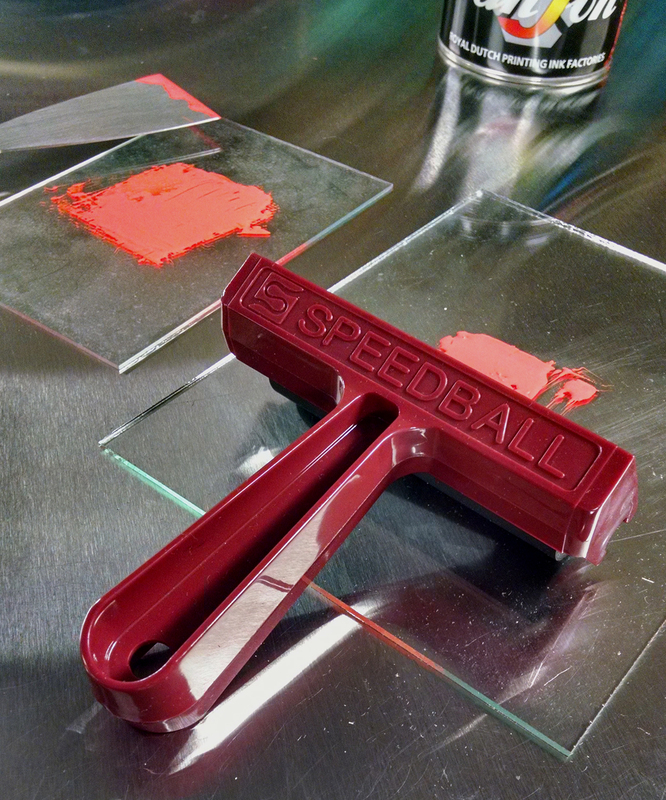 But what about the initial setup costs and the essential items needed to make the printing journey a fun and fruitful one? Below is a list of the essentials (as well as general pricing) to help get you started. We’ve included options for a few select items where you can curb spending or splurge for luxe goods. (Note that these prices do not include shipping costs and are general estimates for the items themselves at the time of this blog post). 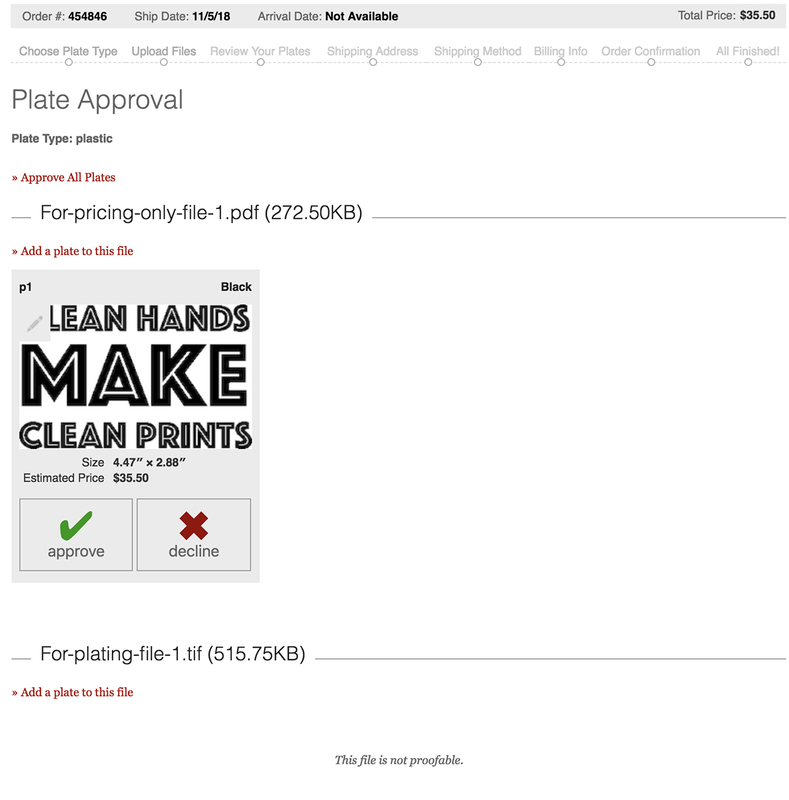 Keep in mind how big (or small) your budget will be for your printing projects as this will be a great way to reduce wallet woes and will help make sure you aren’t making multiple trips out to the store or online for more paper (or worse…. finding out you don’t have all your supplies at-the-ready. Eek!). 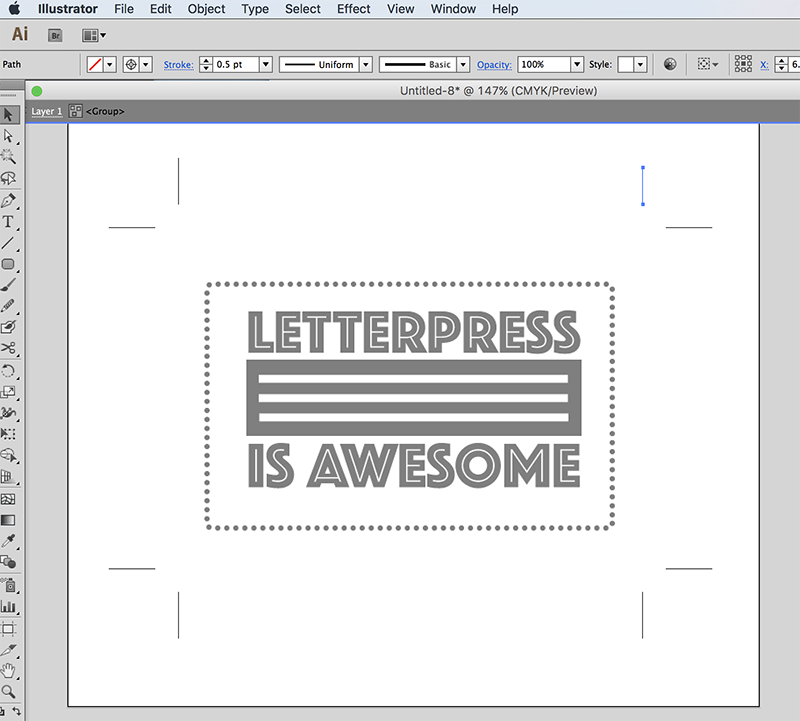 L Letterpress ($75 – $100) – highly recommended. Die Cutting / Embossing Machine that is the platform used for the L Letterpress kit. The Evolution Machine (from We Are Memory Keepers). Prices range from $70 – $150. Other at-home machines that can be substituted – Fiskars Fuse Kit, Sizzix Big Shot, and Cuttlebug. Prices range from $50 – $120. Photopolymer printing plates Boxcar Press platemaking costs: up to 50 square inches of printed-area-only custom made printing plates (KF152 plate type): $35.50. 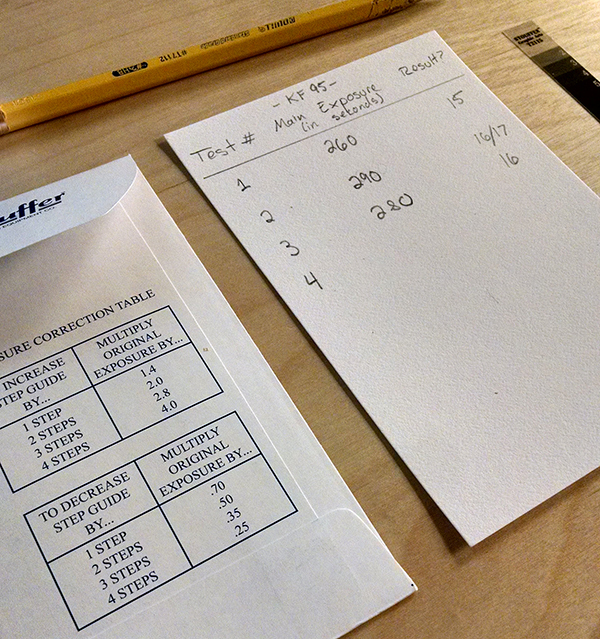 Inking roller bearer plate strips Inking roller bearer strips (from Boxcar Press): Free! 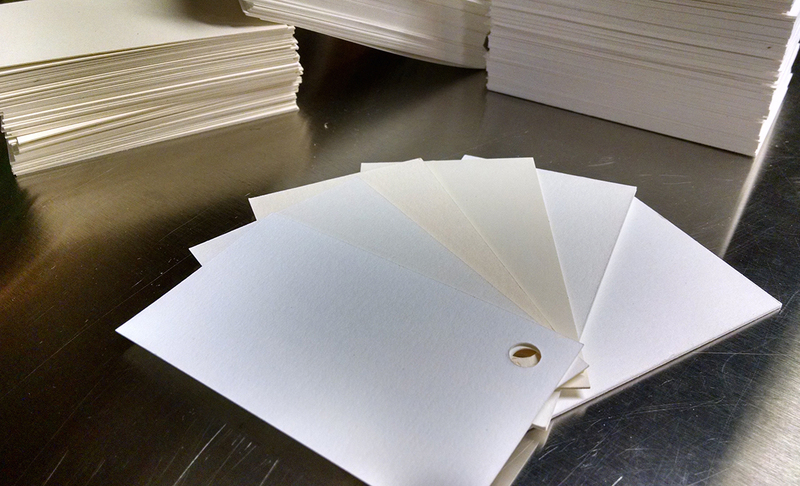 Just request inking roller bearer strips in your custom-made plate-making order. 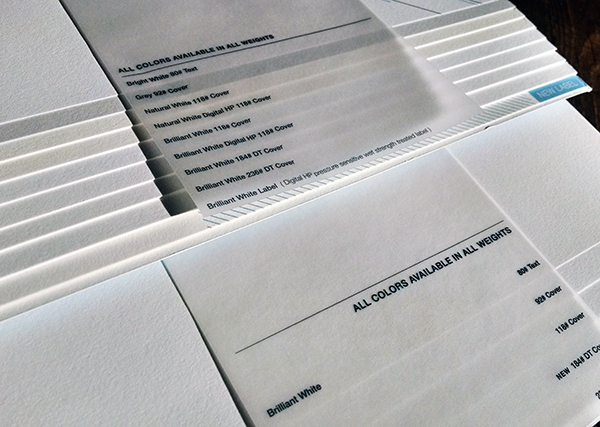 Practice paper: uncoated papers, preferably in 80# cover or thicker. 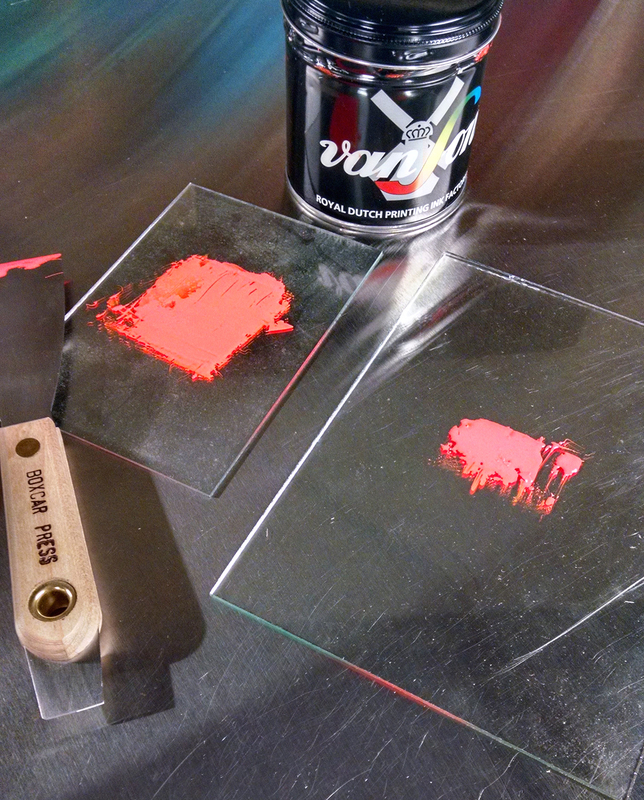 This is the paper you will experiment on as you learn to use your brayer and ink correctly. 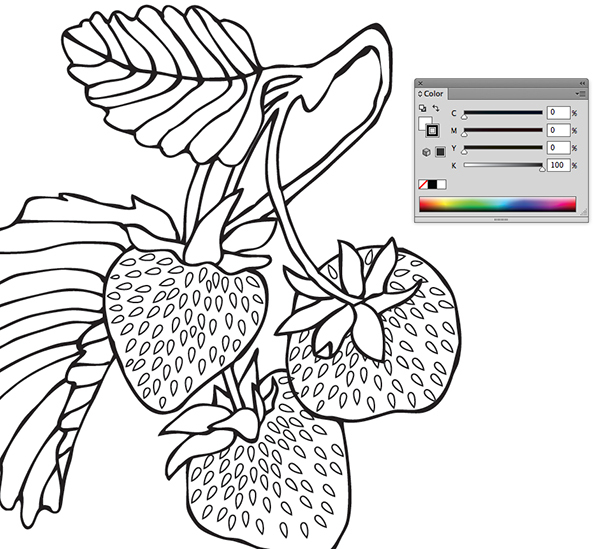 Suggestions are sketchbook paper, uncoated card stock, and bristol stock. Don’t use your more expensive project paper until you are confident in your inking. 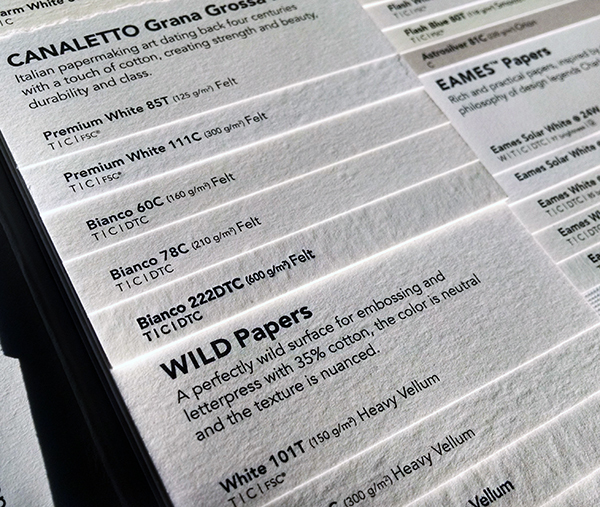 Project paper: fine quality letterpress paper pricing will vary on what brand or type you purchase and the sheet size / quantity you need. 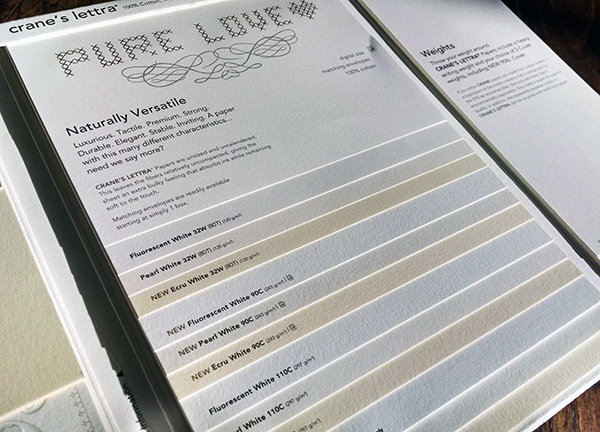 Letterpress papers are uncoated and mostly or all tree-free (cotton, bamboo, and combinations). We recommend the following paper mill brands: Crane’s Lettra, Mohawk Strathmore, Holyoke Cotton, Rives BFK Cotton, Reich Savoy Cotton, Legion Bamboo, Revere Cotton and Somerset Cotton. 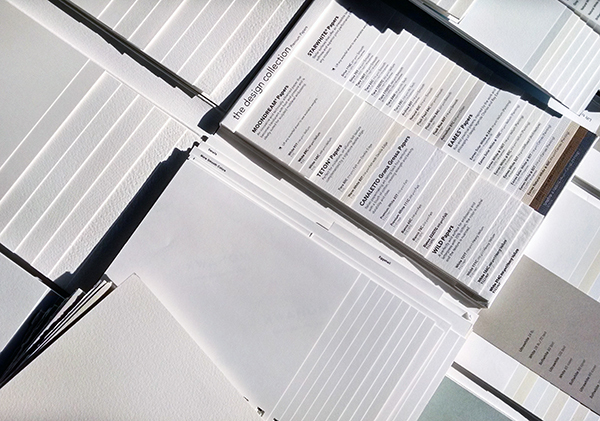 Find a paper that will fit within your paper budget allotment to satiate your printing project’s needs and always remember that ordering a little extra paper is a good suggestion for the inevitable “I goofed” moments. 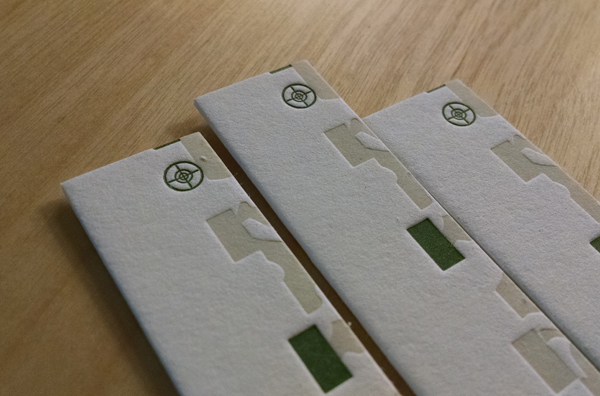 Additional paper suggestions: don’t overlook chipboard, kraft board or home-made paper options for a different look. Soft shop rags (for cleaning up your printing plates) Cut-up old soft t-shirts: Free! Backing/Packing board: use cereal boxes, which are made from a soft chipboard. Placing this behind your paper can increase your impression or bite into the paper. Free after breakfast. As always, let us know in the comments section below how you fared and any suggestions to our list that helped you out. We’d love to hear from you! Whether you are processing photopolymer plates by hand in a DIY set-up or creating photopolymer plates with an industrial platemaking unit, the Stouffer 21-step Gauge is a commonly referred-to item and an invaluable tool to have in your platemaking arsenal. The gauge will help you figure out the exposure times needed for your processing set-up and allow you to make calibrated, quality plates time and time again. What is a Stouffer Gauge? 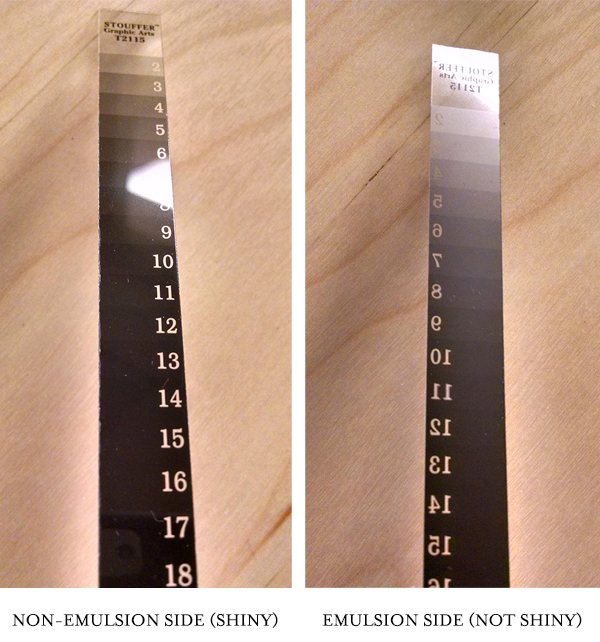 The Gauge itself is a small strip of reusable film negative that has numbers ranging from 1 to 21 corresponding to small blocks (or wedges) of tones ranging from light grey to a deep dark grey/black. The numbers are clear on the film allowing full light to pass through the film. 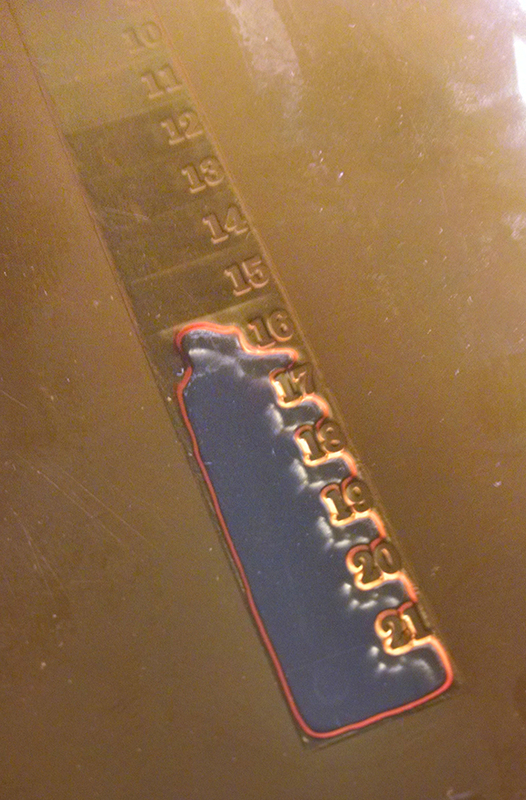 Like a normal piece of film, the Gauge had a dull side (emulsion) and shiny side (non-emulsion). 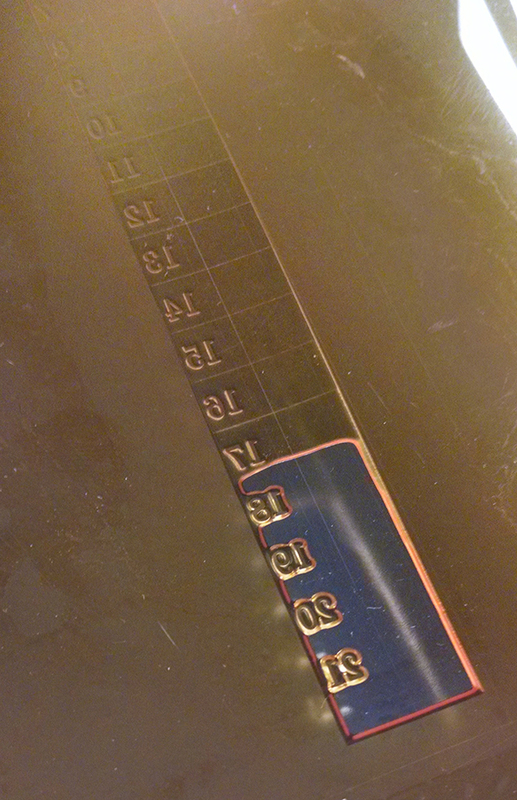 For the gauge that we sell, the dull side (emulsion) shows the numbers in a wrong-reading orientation. The shiny side (non-emulsion) shows the number in a right-reading orientation. When making plates, the dull side (emulsion) should face down and touch the plate. 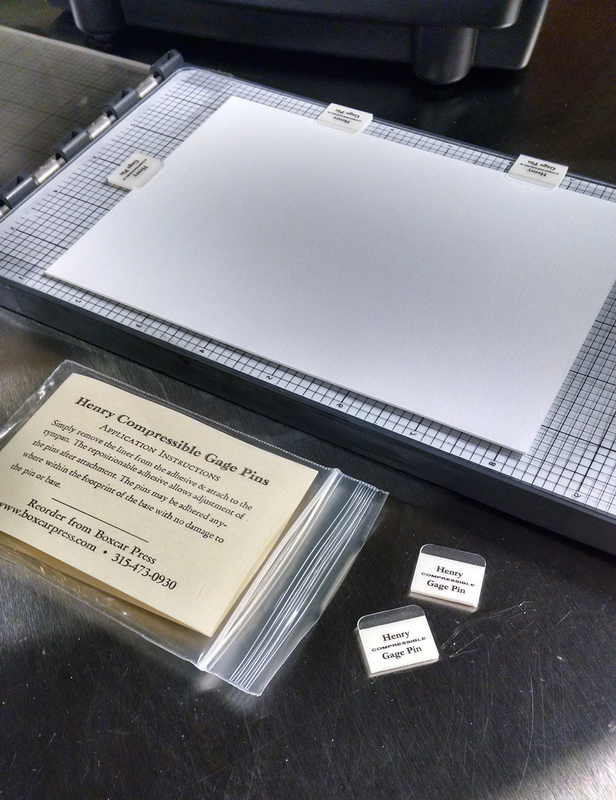 You’ll treat the gauge as a normal positive or negative film and process a small test plate. We recommend that you have a pad of paper & pen handy to record your test results and settings so that you can keep track of what times worked and which ones didn’t. If changing variables, change them one at at time and record your findings. 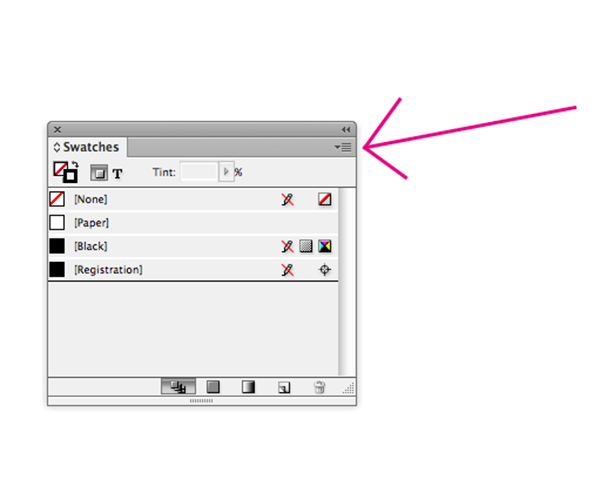 This will keep your test (and results) organized and you can go back to previous tests if you have to backtrack. Before starting, make sure that your bulbs are at 100% and the correct type (UVA bulbs in the 360nm-400nm range – if using black light bulbs – confirm the range). If using the sun as a light source, you’ll need to choose a sunny day, preferably with no cloud coverage. Recommended timeframes are between 11 am – 3pm when the sun’s rays are at their strongest and highest in the sky. Your goal is to achieve the manufacturer’s recommended Stouffer Scale range for that particular plate. 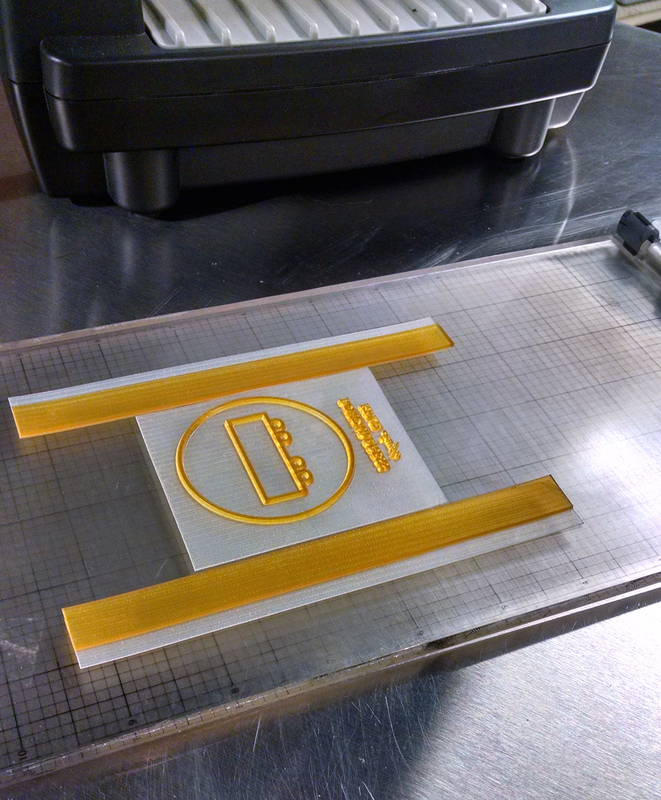 Place the Stouffer Gauge (emulsion side down) on a small square or rectangle scrap of unexposed photopolymer. 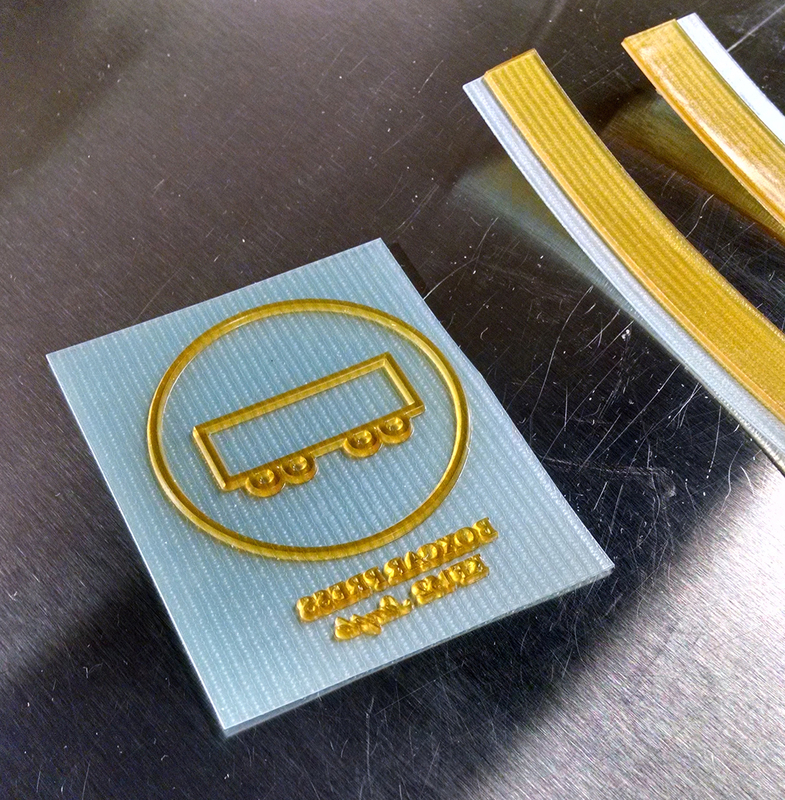 If available, use the manufacturer’s recommended processing times as your starting point. 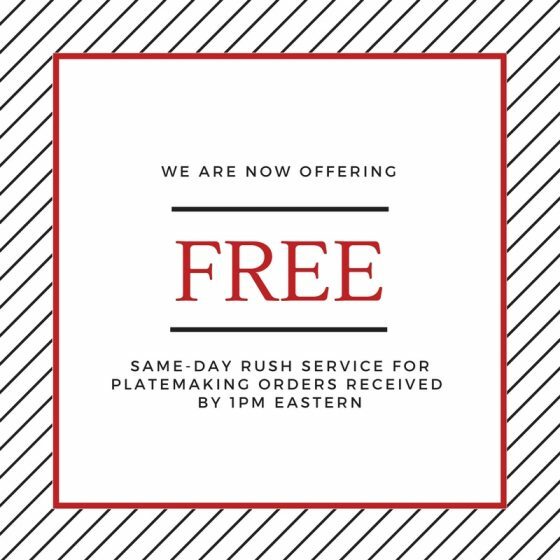 If you need help with determining a good start time, contact us as we’d be more than happy to help out! Expose per instructions for Main Exposure. You should see a faint outline of the stouffer scale when you hold the plate up and at an angle. Follow with Wash-out for the instructed time. If you are uncertain of the time for washout – check the plate at intervals to see if the edges of the exposure are clean and the plate doesn’t feel slippery or slimy. 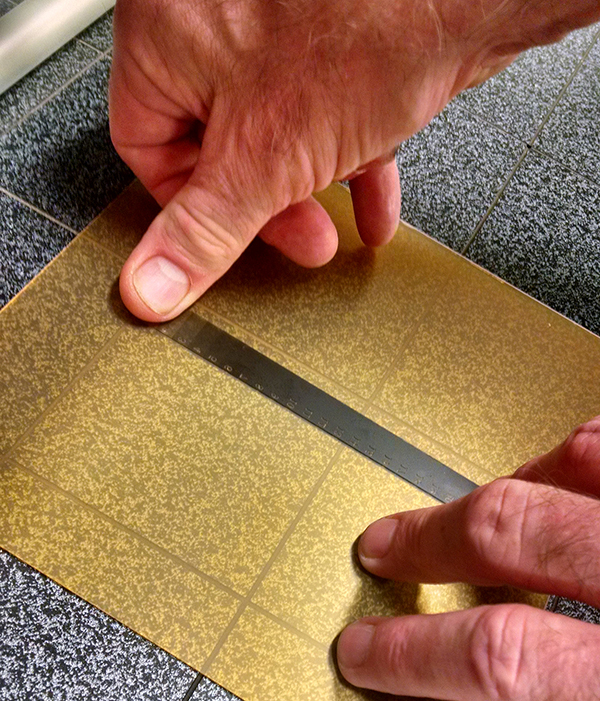 After rinsing the plate and sponging off extra moisture, you can check your Stouffer reading. To determine your exposure reading, read the lowest number of solid relief visible next to the clear exposed section of the Stouffer Gauge. 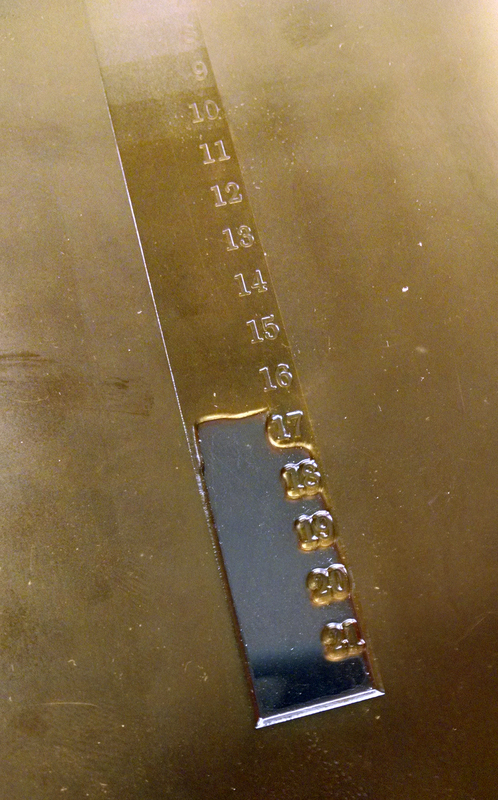 For example, the plate sample seen below has a recommended 16 on the gauge. The photo illustrates a good representation of the 16 wedge. 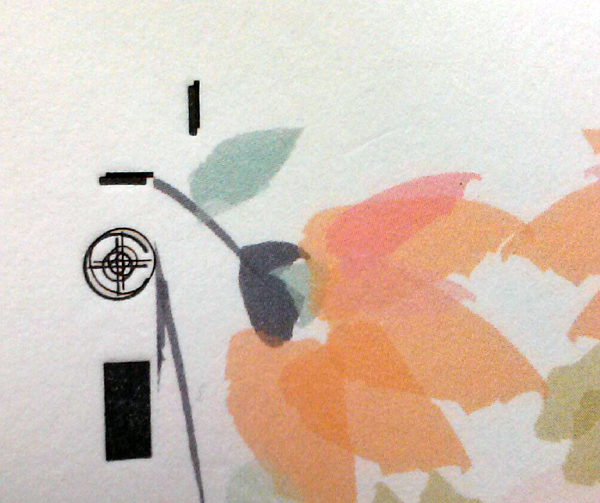 The number (and corresponding wedge) is completely visible (e.g. not fattened, blotchy and not thinned out). 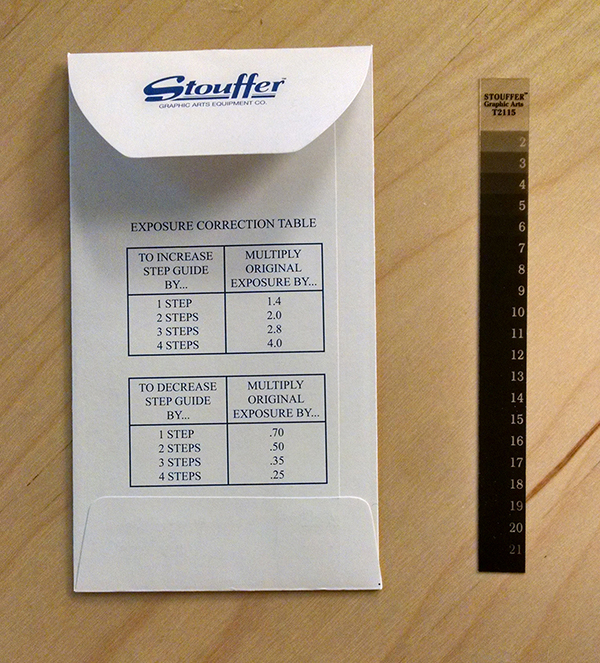 Use the Correction Table (as marked on the back of the envelope that the Stouffer Gauge comes in) to increase or decrease your exposure if you need to. First trial’s main exposure time: 100 seconds resulted in a solid 15 (with the additional observed results of a blobby 16). 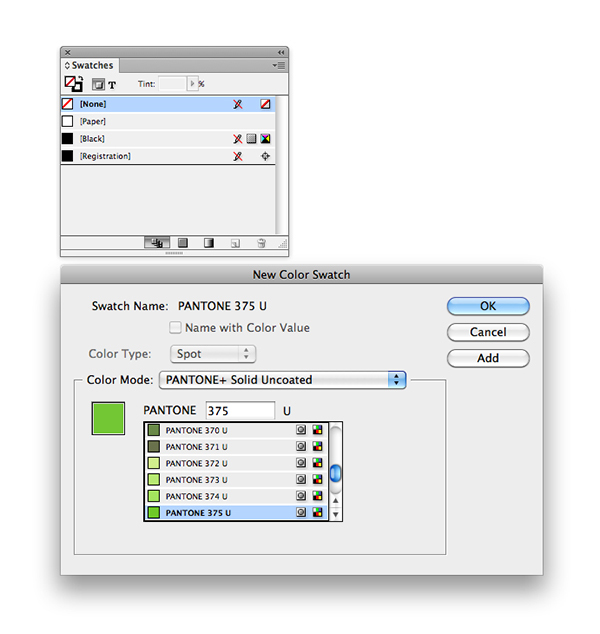 A 15 is considered “underexposed” and too low. Since we’re aiming for a solid 16, we’ll need to go up a step. Using the Exposure Correction Table, to go up a step (increase step guide by…) we need to take our original exposure (100 seconds) and multiply this by 1.4. The next recommended exposure time is then 140 seconds. First trial’s main exposure time: 600 seconds resulted in a solid 17 (with blobby edges around the top of the 17). A 17 is considered “overexposed” and the exposure time is too high/much. As we’re aiming for a solid 16, we’ll need to go down a step. 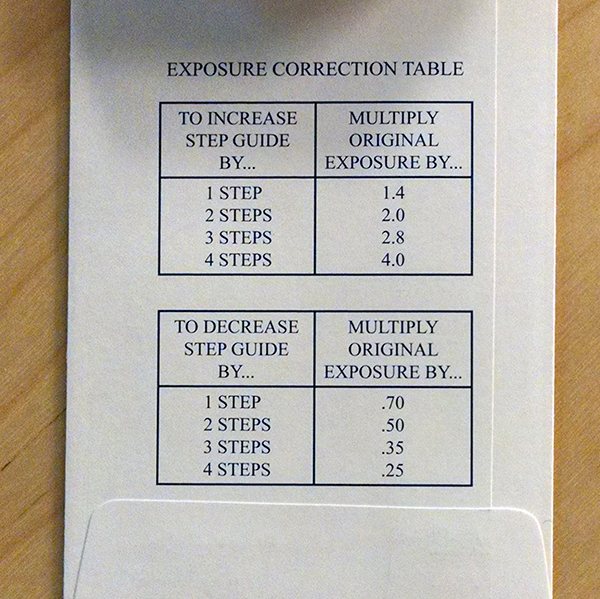 Using the Exposure Correction Table, to down a step (decrease step guide by…) we need to take our original exposure (600 seconds) and multiply this by 0.7. The next recommended exposure time is then 420 seconds. Why are my numbers wrong reading when I’m looking at the fully processed plate? The film strip was incorrectly applied (it was flipped) when placed on the unexposed plate. For the 21-Step Stouffer Gauge, the emulsion side should be face down and be touch the emulsion side of the unexposed photopolymer. If looking down at your set-up, you should be able to see the number and text in a right-reading format. My target number is blobby or washed out What’s happening? If your wash-out and dry times are correct, then you are underexposing your film. But you are almost there to your ideal exposure time. This means that the photopolymer hasn’t been hardened up enough to be able to hold on the plate when your plate is being washed and dried. Try boosting up your exposure time by 1/2 a step. This is where keeping track of your test times will be important. You are narrowing in on the time. 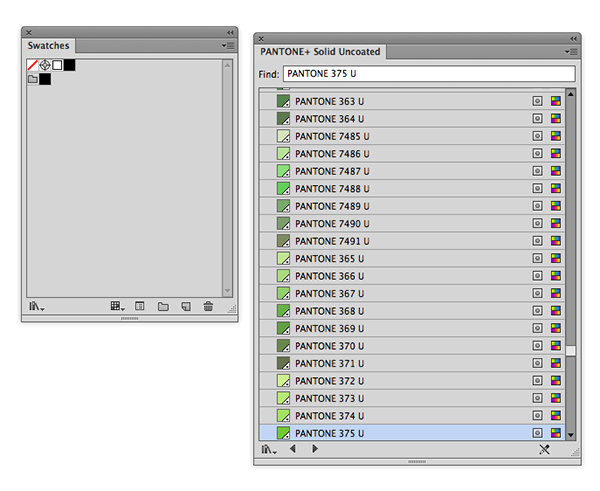 All of my number and tones are completely hardened up and I can’t see anything at all. What gives? If your wash-out and dry times are correct, then you are overexposing your film by a bit. This means that all of the photopolymer has hardened up beyond what you need and is running into the risk of being over-exposed and flaking off. Try shortening your exposure time. I’m recording a really, really long exposure time ( about 10 minutes + ). What’s going on? Bulbs are low wattage (e.g. 15watt): A low bulb emitting a low wattage of light will take much longer to harden the plate as compared to a higher wattage bulb (e.g. 40watt). 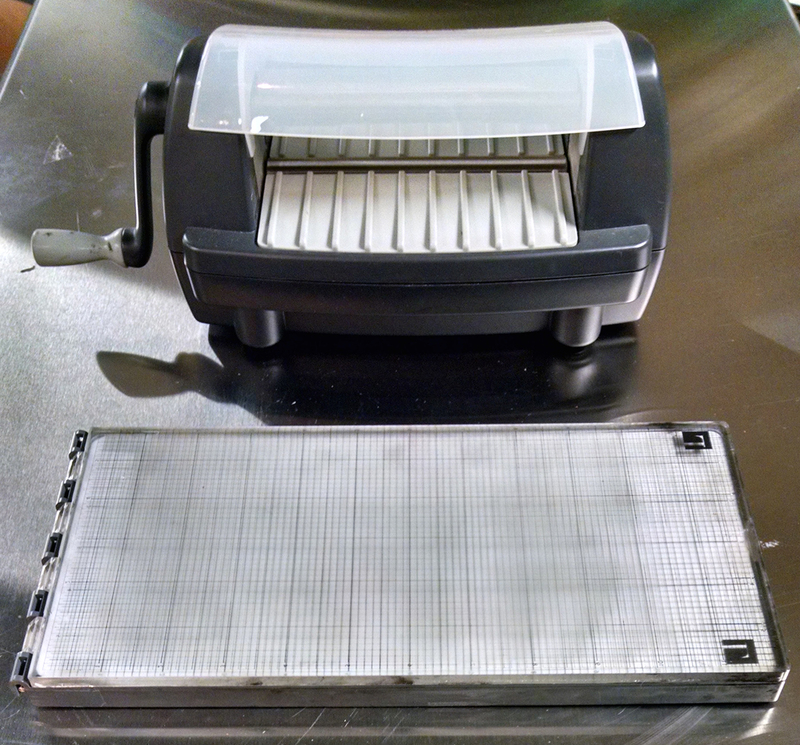 Some platemaking units were not designed to hold higher wattage bulbs. Also consult your platemakers recommended bulb specifications to avoid malfunctions. Bulbs are not outputting at full capacity: Bulbs should be changed if they fall below 70% output. Longer and increased exposure times from your optimal time are a sign of diminishing output. We suggest changing them out for new bulbs as this will give you the most accurate results (Boxcar Press can provide you with new light bulbs). You will need to run a new stouffer test every time you replace your light bulbs. Bulbs are too far from your plates or there are not enough of them or close enough together. Bulbs work best at 1.5” – 3” max away from your plate. Multiple bulbs next to each other give the best results for good plates as the light comes from both the sides and top to create strong relief on the plate. Your exposure unit may need some re-configuration. Using the sun: the sun’s rays will not be uniform in strength or duration as ozone, potential cloud coverages, and other spatial interferences will make the light emission vary in intensity. As powerful an energy source the sun is… it fluctuates and will take a lot longer to expose a plate properly as compared to an industrial exposure unit with calibrated bulbs. But it’s free and plentiful and a long exposure time may be what it takes. This is where your Stouffer scale reading will guide you. I’m using a Nu-Arc. Any tips? The Nu-Arc unit measures in light units and typically only has one bulb that is farther away from the plate. Times for exposure will be longer because of this light source. You will have to rely heavily on your Stouffer Gauge for pinpointing your time. 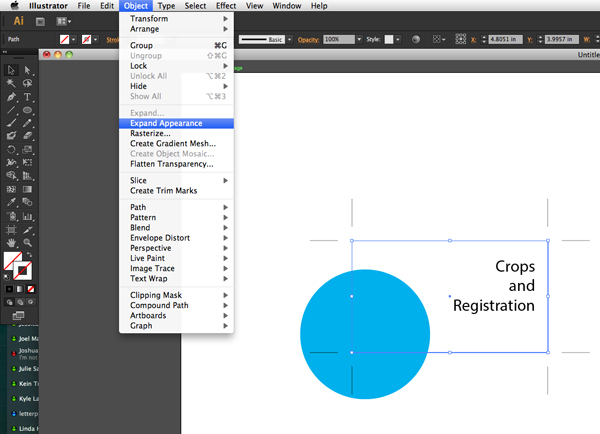 If you have a large model, you may not be able to make a plate as large as the glass frame. The exposure times at the edges of the machine may be different than your center. A stouffer test at the center and corners will help determine that. 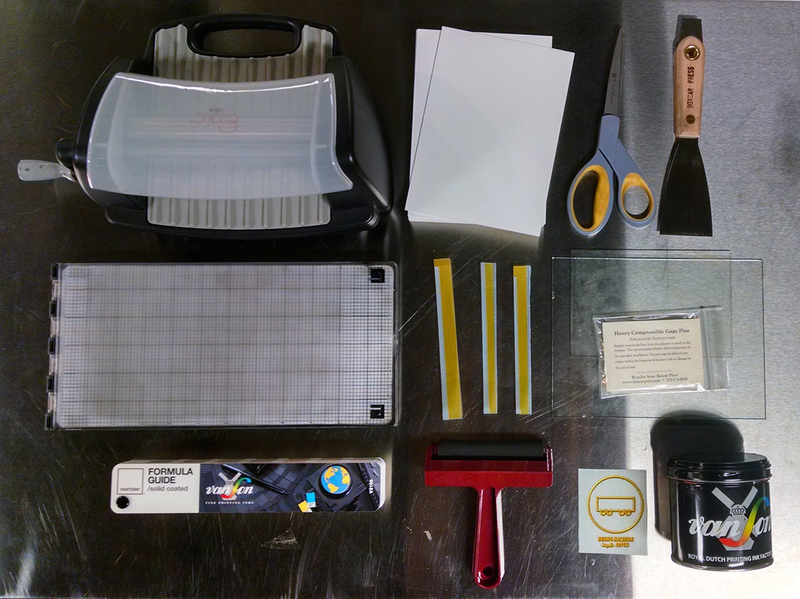 For more helpful tips on the DIY platemaking process and set-up, letterpresscommons.com has a plethora of information to check out here. 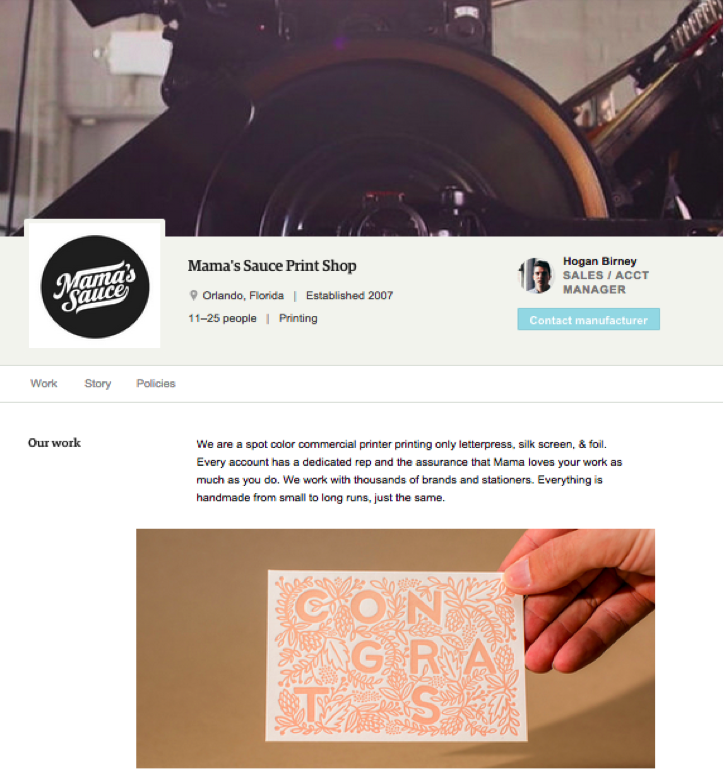 Today we’re sharing some big news from Etsy, who recently introduced an exciting new opportunity for letterpress printers. For those of you who don’t know Etsy, it’s a marketplace where people people make, buy, and sell unique goods. Etsy has grown over the last ten years to support over 1.5 million designers selling their products online. As these designers grow, they need production help to scale. 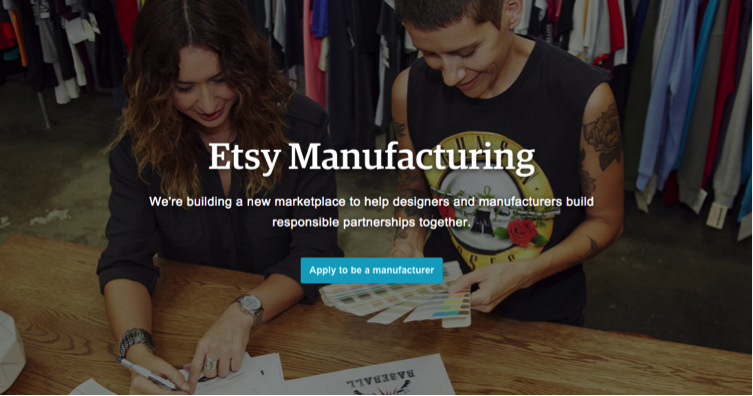 As part of this next step, Etsy has announced Etsy Manufacturing, a new marketplace connecting manufacturers to Etsy designers. Printing is one of the largest categories in need of manufacturing help on Etsy. The great thing about working with Etsy designers is that they appreciate the quality and the craft of the letterpress as much as anyone. The goal of Etsy Manufacturing is not to inundate businesses with irrelevant inquiries, but to provide quality leads that will result in long term partnerships. When someone contacts you through Etsy Manufacturing, you can browse their shop and products to make sure it’s a fit on both sides. You can also make a beautiful online profile for your business – accessible to anyone – in just a few minutes. 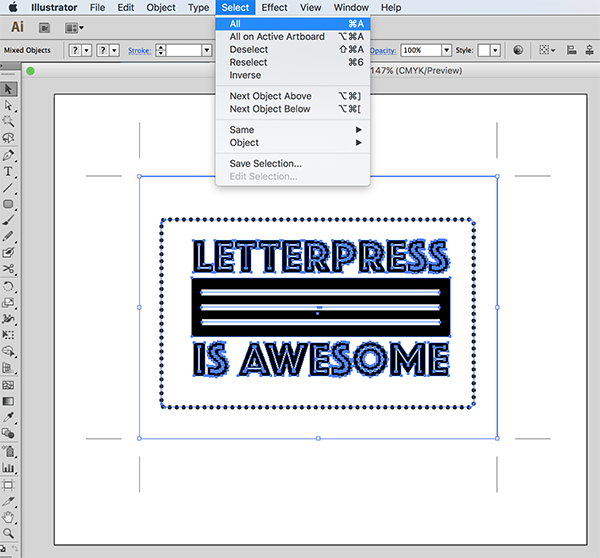 Here’s an example featuring Orlando-based letterpress print shop Mama’s Sauce. Interested? It only takes a few minutes to apply and (in case you were curious) there’s absolutely no cost. You can learn more and apply at www.etsy.com/manufacturing/apply. 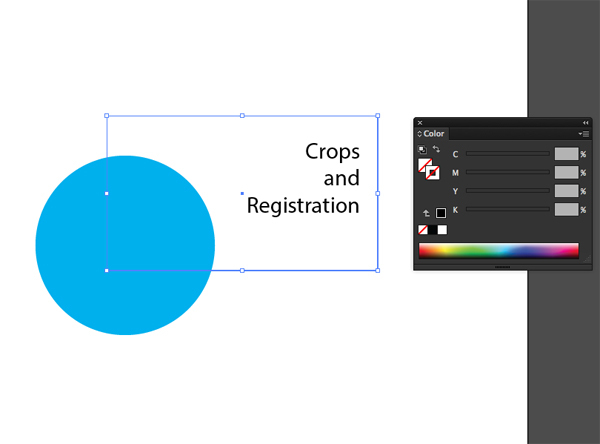 For Adobe enthusiasts who use Photoshop to create their platemaking files, we’d like to introduce you to Lempel-Ziv-Welch, which is a simple algorithm known as LZW compression. 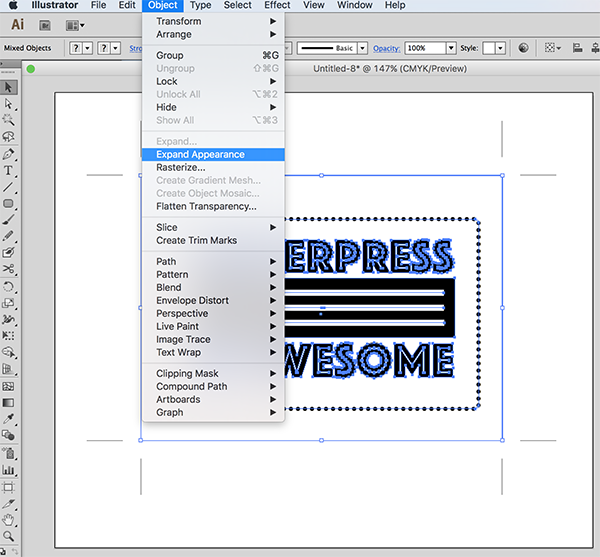 LZW compression makes your file size smaller without losing any image quality. 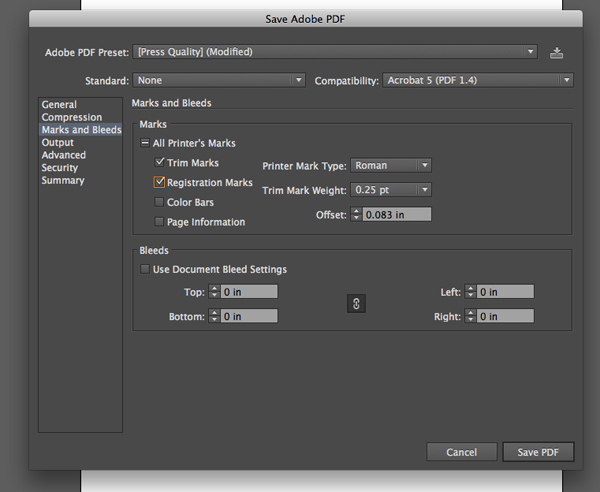 Have a 1200 dpi, 22 megabyte file? No problem with LZW compression. It can compress that file down to mere megabytes and sometimes even kilobytes. Why do you want higher resolution? 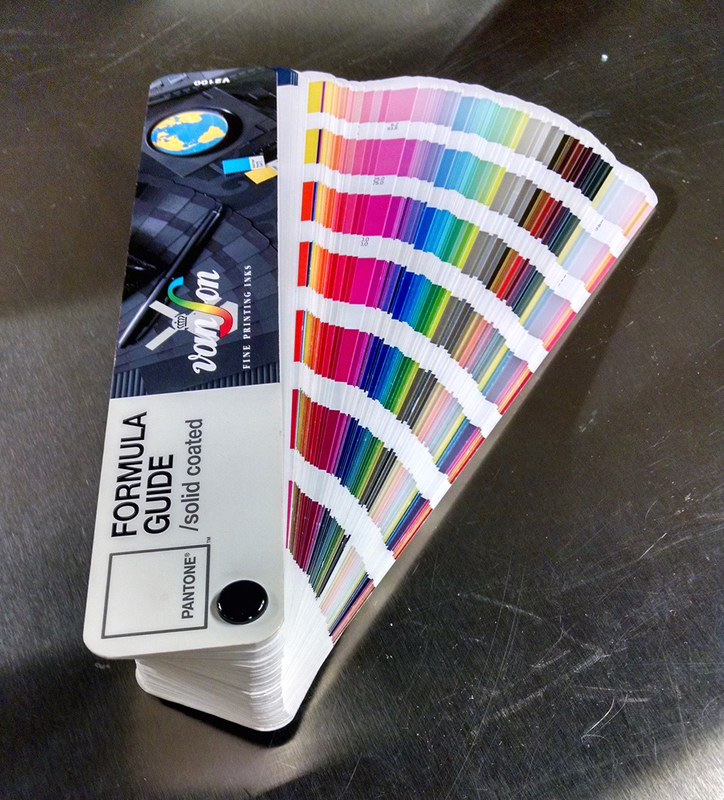 So you can have text and images that are higher quality and pleasing to the eye when printed. Here is how you use the gem that is LZW. 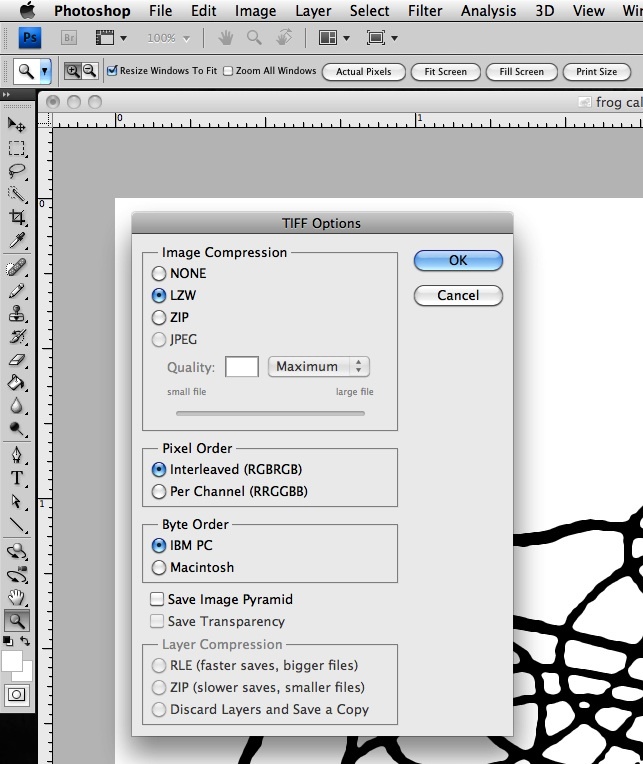 If you have a Photoshop image or text that you need to bitmap for a platemaking line art file, follow these steps. 1. 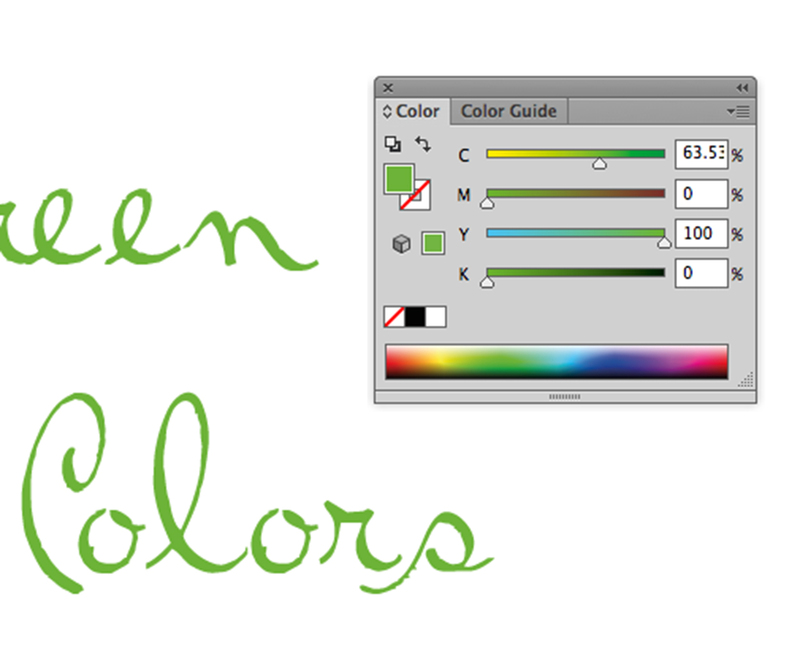 Open your file in Adobe Photoshop. 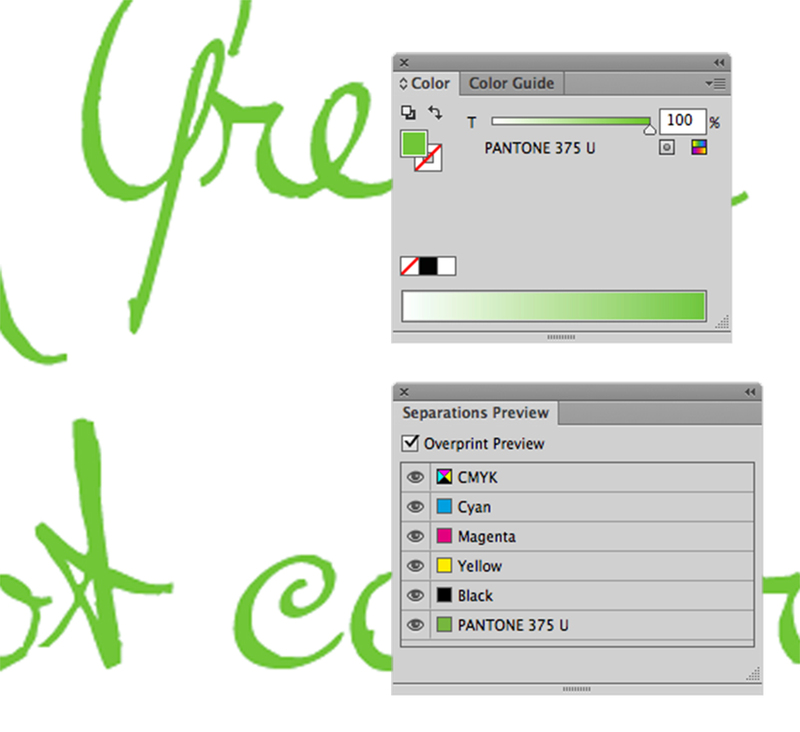 Convert to grayscale via IMAGE > MODE > GRAYSCALE. 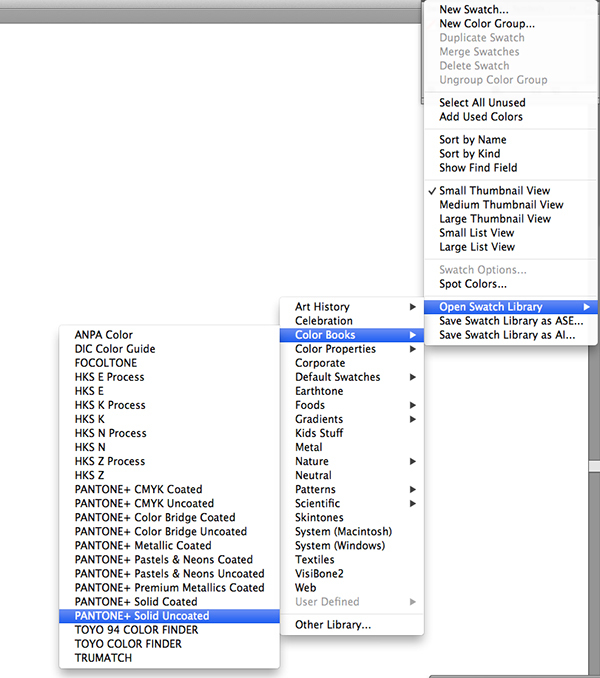 Select Yes if a window asks about discarding color. 2. Check your image size via IMAGE > IMAGE SIZE. 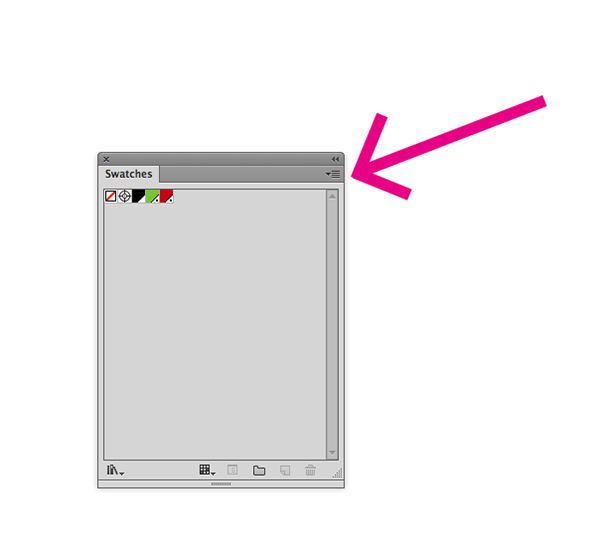 When this window opens up, make note of the Pixel Dimensions at the top. 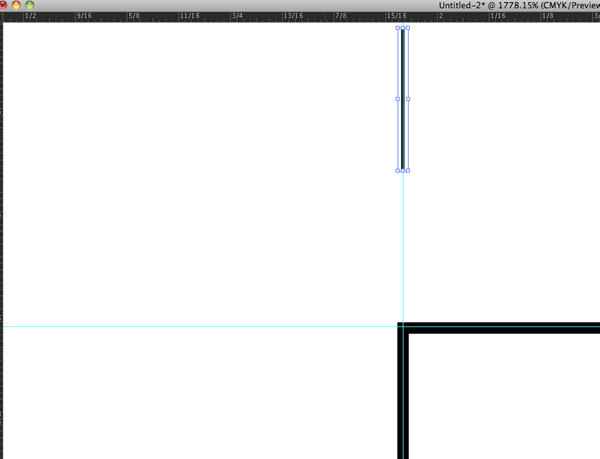 Look halfway down the page at the Resolution of Pixels/Inch. Is the number 300 or less? We can do better! 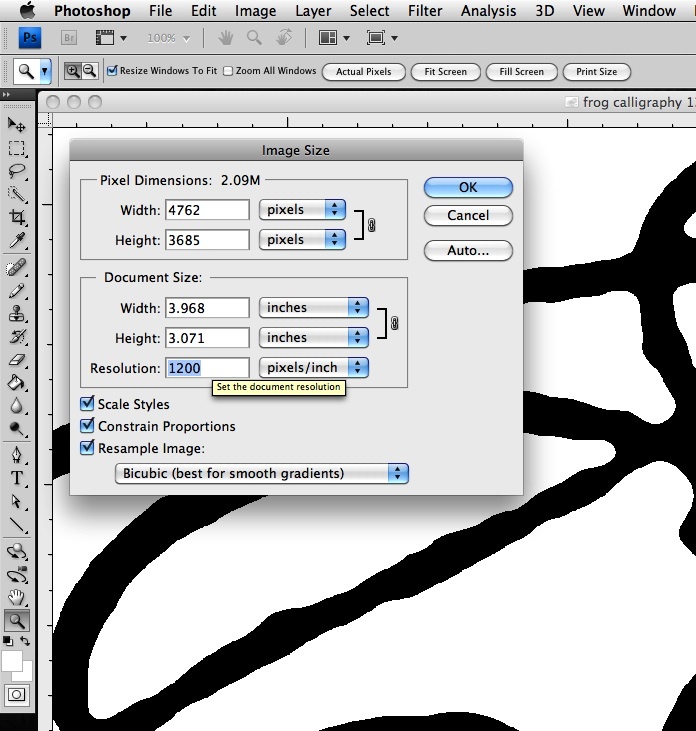 Increasing your resolution can shave and smooth out the pixelation of your bitmapped image. Change your resolution to between 600 – 1200. Did you see your Pixel Dimension make a big jump up? Don’t worry, LZW will take care of that later. Click OK to save this new setting. 3. 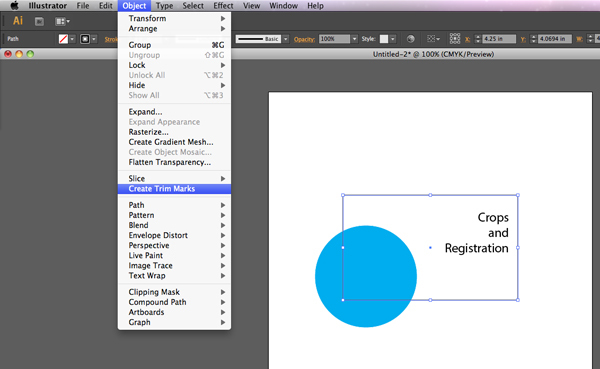 Select LAYER > check to see if Flatten Image is showing. If yes, Click on this. 4. Click on IMAGE > MODE > BITMAP. A window will open to complete this step. Your input should match the resolution you just chose a few steps earlier. 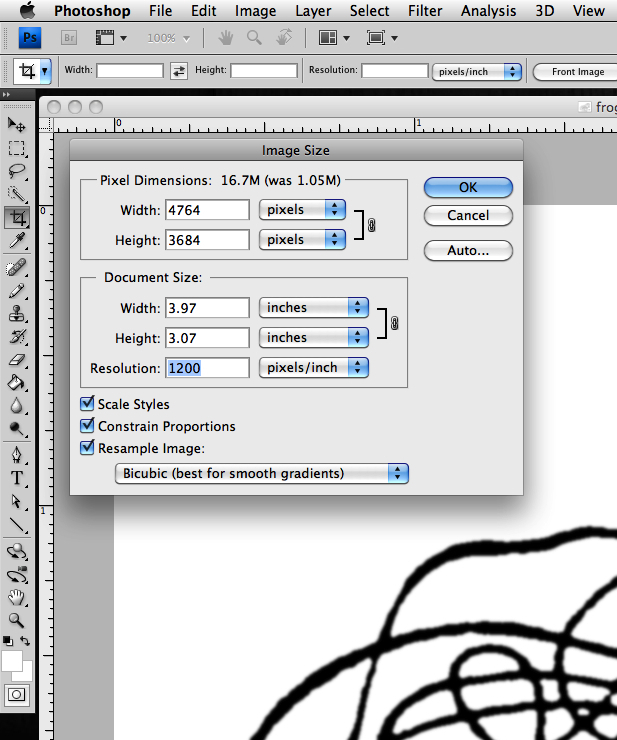 The Output should be equal to or greater than your Input (up to 1200 Pixels/Inch). Your Method should be 50% Threshold. 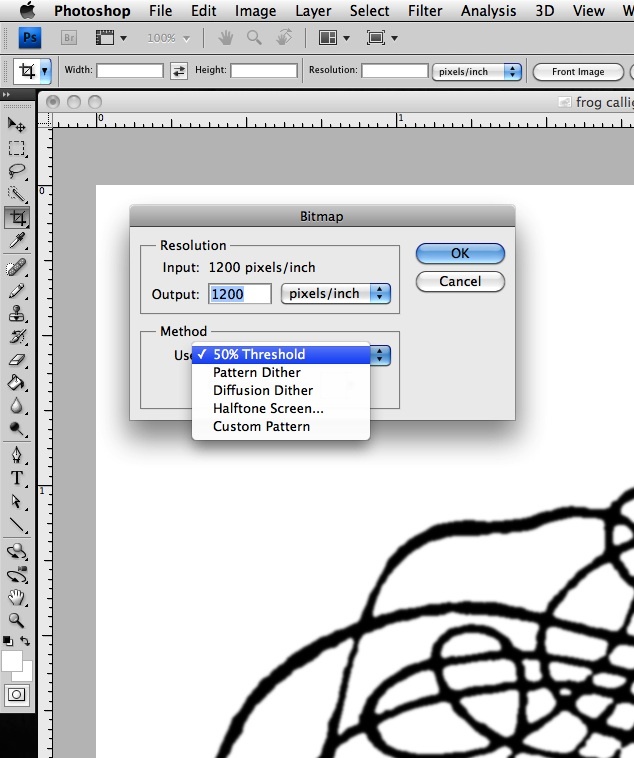 If you are seeing Diffusion Dither (the default), click on the box to see other Method choices to find 50% Threshold. Choose OK. Your file is now in black and white in Bitmap mode. 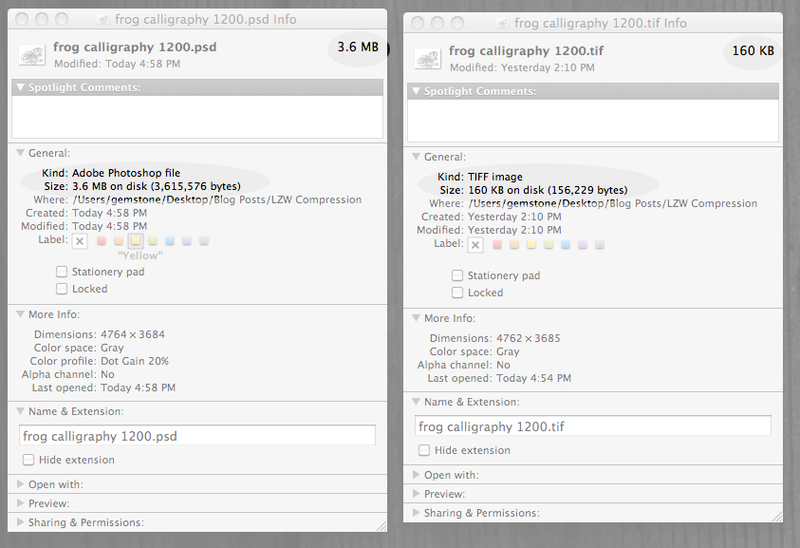 Saving to Bitmap made my file size smaller, you say? Yes, it did, but it is still probably many MB large. 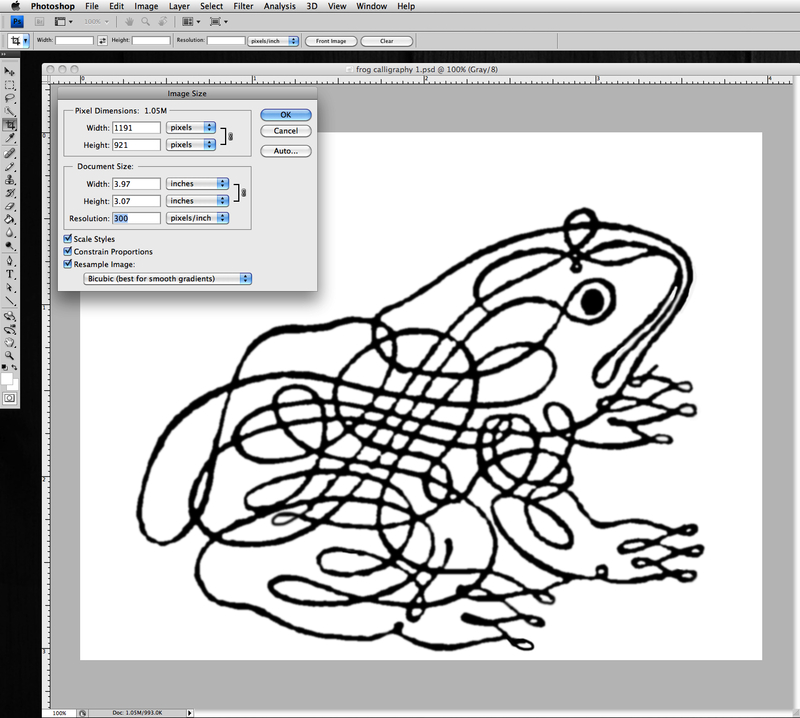 Imagine having 4 or 5 of these files and organizing all this artwork into one large document. 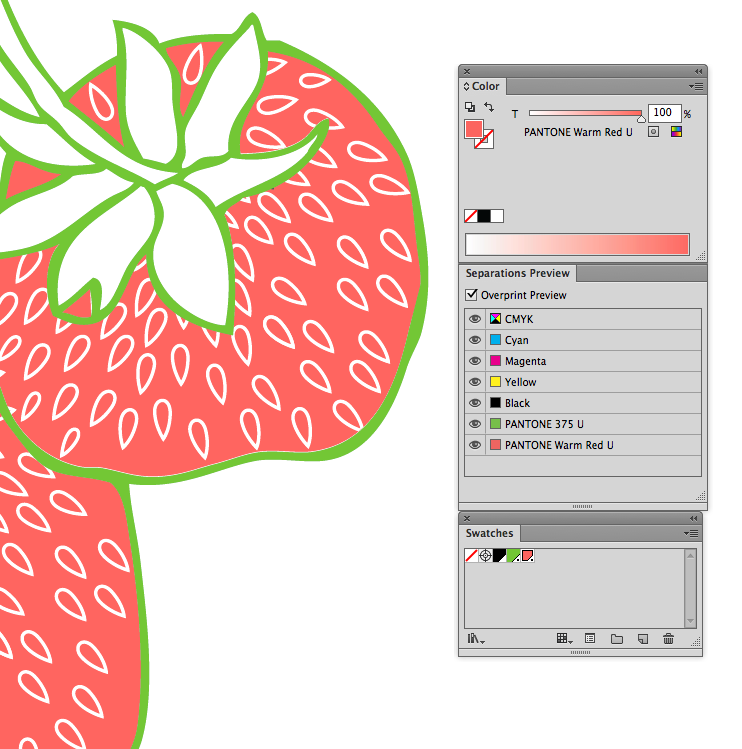 Your new art board can quickly get unwieldy and oversized. 5. To finish up, Select FILE > SAVE AS . The pop up window is looking for your file name and a format. Choose TIFF. Another window called TIFF Options will open. At the top (for Image Compression) select LZW and click OK. Check your folder where you saved your TIFF The size is now probably under 1 MB. Your TIFF document was able to be compressed with all the quality you desire but now in a nicely managed little file.